The need of surface soil removal during reclamation of the former underground landfills makes environmental monitoring difficult to perform. Environmental quality assessment after reclamation is very important because it provides information about: (1) the efficiency of remediation, (2) the rate of biodegradation of contaminants which were not removed during reclamation works and (3) the possible migration of contaminants from soil and permeable host rocks to surface waters and groundwaters. The concept of geoindicators, which was introduced to facilitate the assessment of environmental changes, can help assess environmental quality at sites previously subjected to reclamation. The groundwater quality is usually used as a geoindicator of inorganic contaminants. This concept was applied to find changes in organochlorine pesticide concentrations in groundwaters after toxic pesticide burial ground reclamation. The aim of this study was to monitor the concentrations of organochlorine pesticides and their metabolites in groundwaters at the former pesticide landfill site after its remediation. The study showed that very high concentrations of organochlorine pesticides and their metabolites in a contaminated soil had a small influence on pesticide concentrations in groundwaters and that this influence decreased in time. It has been 2 years since reclamation of the landfill took place, and the concentrations of organochlorine pesticides in groundwaters dropped to acceptable levels within the current environmental quality standards. Large amounts of pesticide waste buried in countrywide dispersed landfills called “pesticide tombs” have been one of the most serious threats to the environment in Poland for the last decades (Zaleska and Hupka 1999; Amador Uijtewaal 1992). Prior to the political and socio-economic transformations in Poland, which took place in 1989, the Polish agriculture was mostly centered around large farms owned by the socialistic government (State Agricultural Farms). This form of collective farming, based on the Soviet sovkhoz model, produced large amounts of obsolete pesticides. The first burial grounds were built in 1965. A substantial number of pesticide tombs appeared in the mid-1970s of the twentieth century, after banning the use of organochlorine pesticides. The easiest way to get rid of these pesticides was to bury them in underground landfills. Toxic wastes were usually placed in concrete cases or wells, and insulated with tar at the bottom. There were no guidelines for building of these landfills and they were mostly located in forests, far from residential areas. Neither geological and hydrogeological parameters were considered during construction works nor proper location and documentation of landfill technical parameters were prepared. This attitude created a serious risk of groundwater contamination. In the 1980s of the twentieth century the last pesticide burial grounds were constructed, but these new and the old ones had still been in use for the next 10 years. In 1993 pesticide tomb inventory works were conducted by the Inspection for Environmental Protection. According to Grzybowski et al. (2004), about one hundred pesticide tombs were constructed at a distance of less than 1 km from drinking water intakes and 75 pesticide tombs close to rivers or lakes. The first pesticide burial ground reclamation works began in 1999 and since that time these landfills have successively been remediated. Reclamation of these highly contaminated sites is a very difficult, time consuming and expensive task (Kempa 1997). According to the recent data from the website of the Polish Ministry of the Environment (http://www.mos.gov.pl/kategoria/2641_przeterminowane_srodki_ochrony_roslin/, Accessed 11 Nov 2010), the total number of reclaimed landfills on the day of June 30, 2010 was 180 with about 16,367 tons of toxic wastes. Sixty-two pesticide tombs have been under reclamation or have not been reclaimed yet and the estimated amount of the wastes is 3,753.06 tons. The pesticide waste stored in underground landfills in the area of Poland represents the largest accumulations of these chemicals throughout the world (Skoczko and Ignatowicz 2007), although the problem of toxic agrochemical waste disposal sites is also known from other countries of the former communistic block, e.g. Ukraine (Gurzhiy 2008). In the 1990s of the twentieth century a new tool of assessing the quality of the environment was introduced (Berger 1997, 1998). The idea of geoindicators is based on the assumption that the abiotic processes, although usually ignored in environmental reports (Berger 1997), may be as crucial for interpreting natural and human-induced changes in the environment as the biotic ones. According to Berger and Iams (Berger 2002), the geoindicator is “a magnitude, frequency, rate or trend of geological processes and phenomena that occur at or near the Earth’s surface and that are significant for assessing environmental change over periods of 100 years or less”. There are many advantages of using geoindicators for environmental change evaluation. The geoindication studies are usually non-destructive and have a little environmental impact. Moreover, many of them are cheap and easy to perform (Berger 2006). Of the 27 geoindicators which were introduced by the International Union of Geological Sciences, three were proposed for groundwaters: (1) groundwater quality, (2) groundwater chemistry in unsaturated zones, and (3) groundwater level (Berger 2006). In the study of groundwaters as geoindicators, the temporal changes of groundwater chemistry and hydrodynamics are the most important issues. These changes may be of natural or anthropogenic origin. The three geoindicators mentioned above are strongly influenced by anthropogenic contaminants. Until now, groundwater quality as a geoindicator has been applied to indicate pollution sources mostly in areas not heavily contaminated with inorganic substances (Giedraitiene et al. 2002; Klimas and Gregorauskas 2002). One of the examples of such study is a 7-year monitoring of groundwater collected across the Polish–Lithuanian borderland (Giedraitiene et al. 2002). The authors observed an increase in chloride and sulfate ion concentrations and differences in groundwater chemistry in the study area, which in their opinion might be attributed to the land use. The most complete studies on groundwater as a geoindicator were conducted by Klimas and Gregorauskas (2002) in Lithuania. According to these authors, the raised concentrations of Cl−, SO4 2− and NO3 − in groundwater might be influenced by an increase of downward migration of contaminants as a result of groundwater abstraction that activates saltwater encroachment. In another study of groundwater as a geoindicator conducted in the city of Río Cuarto, Argentina by Blarasin et al. (2003), chemical analyses of NO3 −, NO2 − and Cl− together with EC and TDS measurements were found to be the most useful for tracing changes in groundwater chemistry. In this study, the groundwater quality was used as a geoindicator of organochlorine pesticide contamination in a former pesticide tomb location. A decrease in pesticide concentrations in groundwater to acceptable levels during 2 years after pesticide tomb reclamation is very important information about reclamation effectiveness. This study shows that the groundwater is a sensitive geoindicator of environmental contamination with organochlorine pesticides. The substantial improvement of environmental quality was recorded after a year from pesticide landfill reclamation. Franciszkowo is a small locality in northwestern Poland with a population of about 170 inhabitants. In the study area, the average annual precipitation is 580 mm, including 220 mm during the fall and winter period and 360 mm during the spring and summer (Manecki 2008). Moderate, western and northwestern winds prevail and the average temperature is 7.4 °C (13.8 °C in the spring-summer and 0.8 °C in the fall-winter). The study area is located within the northern limb of Pomeranian (Middle-Polish) Anticlinorium. Lower Jurassic rocks are covered with Paleogene and Neogene lagoonal-lacustrine and terrestrial sediments. These sediments are represented by Oligocene dammed lake silts, siliceous muds, mudstones and claystones and Miocene sands, siliceous muds, mudstones with claystone interbeds, claystones, carbonaceous claystones and brown coals. Pliocene sediments are unevenly distributed and consist of claystones, variegated clays and muds. The top of the Neogene deposits in the study area reaches 60 m a.s.l. The youngest Quaternary sediments comprise postglacial deposits (tills, clays, sands and gravels) averaging 60–100 m in thickness. The aquifers are located within Paleogene, Neogene and Quaternary deposits (Kachnic 2004) and the major useful water-bearing level occurs within clastic Miocene sediments and its water-table occurs at a depth of 90–140 m. These hydrogeological conditions create a very low risk of groundwater contamination. In the vicinity of the pesticide tomb, groundwater level occurs at 120–122 m a.s.l. In general, the water-table contours refer to the geomorphology of the study area and show a possible radial groundwater flow. The natural hydraulic gradients are low and range from 0.06 % (N–NW direction) to 0.13 % (SW direction) (Manecki 2008). Such a small groundwater flow velocity will favor very low flow rates (theoretically, about 3–12 m per year). The pesticide tomb in Franciszkowo (Fig. 1a), which was probably established in 1971, was extended twice—in 1974 and in 1988. Pesticides, including DDT and lindane, as well as other chemicals and their packagings (bottles, boxes and bags) were stored there during 1978–1994. The burial ground covered a rectangular area of 1,622 m2 with 45 wells of 2 m in depth and 1.1–2.25 m in diameter and one large pit (Fig. 1b). Most of the wells (32) and the pit in the western and central parts of the burial ground were filled up with chemicals. The wells were reinforced by concrete rings, but spaces between them were not adequately protected against leakage. The top of each filled up well was sealed with concrete, whereas the bottom of most wells was isolated with plates. Two wells had broken plates. The pit was not covered with a protective layer. The presence of damages in temporarily protected wells and the storage of toxic wastes in unprotected pit favored permeation of contaminated waters deep into the ground, where the pesticides were more persistent. The reclamation of burial ground in Franciszkowo was done in 2006. All chemical substances were taken from the wells and pit (Table 1). In all, 382.02 tons of contaminated concrete and brick wastes together with 999.7 tons of contaminated soil was excavated and transported to the remediation site (hazardous waste landfill in Gorzów Wielopolski, northwestern Poland). The excavated pesticides (235.76 tons) were transported to hazardous waste incinerator SAPRI in Dąbrowa Górnicza (Upper Silesia, southern Poland). The bottom of all these pits was lined with bentonite geomembrane and filled up with two types of clean soil-rich in humus at the top and less permeable mineral soil beneath it. The remediated area was planted with trees. Remediation was done by “Hydrogeotechnika” company and supervised by the first author of this article (Piotr Manecki). As pesticides had been removed from the burial ground in autumn 2006, 14 soil samples were collected from different depths at four investigation sites. Localization of sampling sites is presented in Fig. 1b. The soil samples were placed in glass jars covered with aluminum foil to protect from photodegradation of organic compounds. The samples were immediately transported to the laboratory for further preparation prior to chemical analyses. The groundwater samples were collected three times (in the fall of 2006, 2007 and 2008) from two punctual piezometers. The first piezometer was located 50 m north and the other one 250 m south-west of the landfill. Both piezometers were made of high pressure PVC tubes of 100 mm in diameter. The lithological description of the profile is presented in Table 2. Before sampling, the stagnant water was pumped out of the well. The water samples were placed in amber glass bottles, transported to the laboratory and kept at a temperature of 4 °C prior to chemical analyses. The analytical procedure applied in this study was based on the Taylor and Bogacka (1979). The extraction was done with n-hexane, purified with FLORISIL in a chromatographic column. The gas chromatograph with an electron-capture detector (GC model 504 Mera-ELWRO, Poland), fitted with a 366 cm × 2 mm id 1.5 % SP-2250/1.95 % SP-2401 on 100/120 Supelcoport column (Supelco Inc.) was used for the determination of selected organochlorine pesticides and their metabolites (metoxychlor; heptachlor; α-HCH; β-HCH, γ-HCH; dieldrin; endrin; p,p′-DDT; o,p′-DDT; p,p′-DDD; p,p′-DDE). The temperature of the injector, oven, and detector was 200 °C. The carrier gas was nitrogen at 30 cm3 min−1 flow rate. Two organochlorine standard mixtures in hexane (IPO LH 104 and IPO LH 101) produced by the Institute of Industrial Organic Chemistry Analytical Department, Poland were used. Chemical analyses were performed in the accredited laboratory of the Geological Enterprise PROXIMA S.A. in Wrocław, Poland. where m i is the thickness of successive layers of unsaturated zone profile (in meters), w o the average volumetric moisture of successive layers of unsaturated zone and I e is the infiltration recharge in the soil profile (in millimeters per year). For calculations, the following parameters were used: average precipitation of 580 mm per year, volumetric moisture: 10 % for fine-grained sands and soils, 24 % for clays, clayey and silty sands and infiltration recharge: 145 mm for fine-grained sands, 116 mm for silty and clayey sands, 58 mm for clays and 87 mm for soils. The time of infiltration through unsaturated zone is about 5 years and the time of migration of contaminants is longer due to their sorption by soils and rocks. As it was already mentioned, the pesticide landfill in Franciszkowo was active in the years 1978–1994. During a period of 12–28 years (before the reclamation) pesticides may have migrated and contaminated the most shallow groundwater level. In 2006, i.e. before the pesticide landfill reclamation, the four soil samples were collected near the wells from a depth of 0.5–2.5 m. Location of sampling sites is presented in Fig. 1b. The concentrations of pesticides in soils were very high (Fig. 2), which was a consequence of leakage from the damaged wells. Most of the pesticides (α-HCH, γ-HCH, DDT, its metabolites, and dieldrin) showed concentrations above accepted levels for industrial soils in Poland (The Regulation of the Minister of the Environment on the Soil Quality Standards 2002). Of the individual compounds, p,p′-DDE, o,p′-DDT, p,p′-DDD, p,p′-DDT and dieldrin were enriched in soils at site 2. In a sample collected at a depth of 0.5 m, the maximum allowable concentrations exceeded 412 times those for DDT/DDE/DDD, 44 times for dieldrin, 126 times for α-HCH and 6,086 times for γ-HCH, respectively. The compound that exhibited the highest concentrations within all the investigation sites was p,p′-DDT. Only at site 1, the pesticides accumulated in deeper soil horizons. Topsoil at sites 2 and 3 was enriched in these chemicals, whereas at site 4 they exhibited comparable concentrations at a depth of 0.5 and 2.5 m. Very high concentrations of pesticides in soils created a serious risk of groundwater contamination. The groundwater samples, collected after pesticide tomb had been reclaimed in 2006, revealed elevated levels of p,p′-DDD, p,p′-DDT and γ-HCH (Fig. 3). Some of the pesticides, namely p,p′-DDE, aldrin, endrin, β-HCH, heptachlor, heptachlor epoxide and metoxychlor showed concentrations below detection limit (<0.001 μg/l). According to the Polish regulations, the total pesticide concentrations in groundwater should not exceed 0.5 μg/l for the best quality waters (I class) (The Regulation of the Minister of the Environment on the criteria and guidelines for groundwater quality assessment 2008). The preliminary studies conducted before the reclamation of the landfill showed that organochlorine pesticides prevailed over the other groups of pesticides (Manecki 2008). Considering this, the results of the present study did not indicate a serious deterioration in groundwater quality as a result of underground pesticide disposal. The chemical analyses of groundwater samples in 2007 and 2008 displayed an improvement in their quality expressed by lower pesticide concentrations (especially p,p′-DDD, p,p′-DDT and γ-HCH) (Table 3). Changes in contamination of groundwater with organochlorine pesticides and their metabolites, caused by both removal of the waste from landfill and possibly biodegradation of these compounds (Baczynski et al. 2010), give an opportunity of using groundwaters as geoindicators after reclamation of contaminated soils. The changes in pesticide concentrations after the removal of contaminated soil and waste, which were the initial sources of pesticides in the groundwater, can be explained by natural attenuation of the study site (Nobre and Nobre 2004). The most probable mechanisms of natural attenuation in the groundwaters examined encompass physical processes, such as dispersion and dilution combined with biodegradation. Because the contaminated materials (soils, waste and construction elements) have been removed from the site, it seems that the study of groundwater in the vicinity of this site is invaluable for environmental quality assessment. 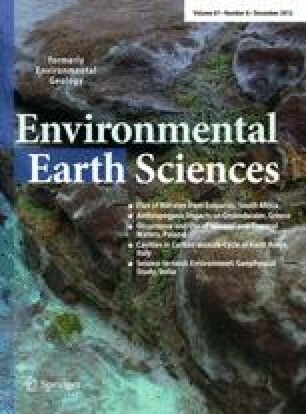 This study shows that despite favorable geological conditions for location of toxic landfill in Franciszkowo, there has been a real threat to groundwater contamination. When remediation started, the concentrations of p,p′-DDD, p,p′-DDT and γ-HCH were distinctly elevated, thus confirming that the leakage from damaged wells migrated through soils and bedrock. The changes in concentrations of organochlorine pesticides and their metabolites recorded in the groundwater from two piezometers in a period of 2 years after the pesticide tomb had been reclaimed might be used as a geoindicator of the site quality. The man-made organic compounds that occur in groundwater seem to be better indicators of its quality than trace elements or inorganic substances, which often originate from natural, e.g. geogenic sources. The natural attenuation of organochlorine pesticides in groundwater, which is responsible for the dynamic changes in their concentrations, explains the decrease in contaminant concentrations during the study period. The authors would like to express their gratitude to Professor Zdzislaw M. Migaszewski of Jan Kochanowski University in Kielce for reading the manuscript and for his invaluable remarks and comments.